Rep. Janice Hahn (D-San Pedro) held a press event this morning to announce $443,000 in new grants from the Federal Transit Administration to Community Career Development, Inc., the nonprofit operatore of the Compton and Wilshire Metro WorkSource Centers. 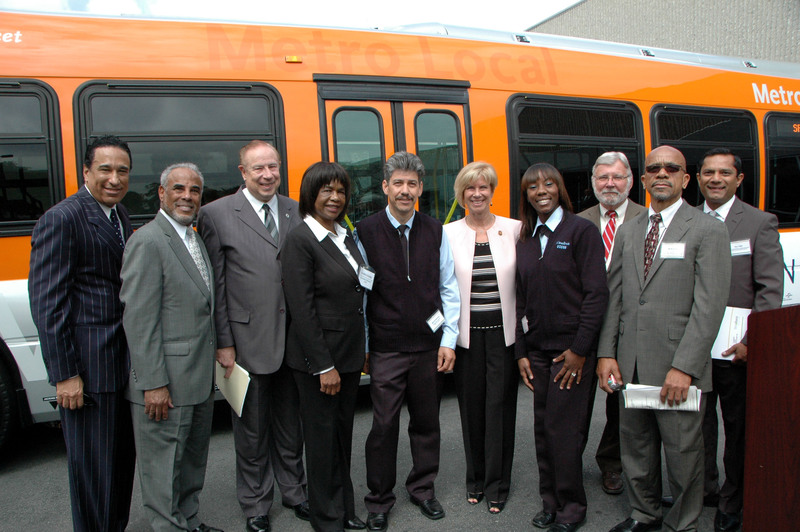 The Centers provide job training to low-income minorities who are seeking employment as Metro bus operators. The goal of the new funding is to help hire at least 200 new operators, according to the FTA. Here is the FTA’s news release on the grants. From left in the above photo: Gregory Irish, Interim G.M. city of Los Angeles Community Development Department; Michael Dolphin, Division Chief, Employment Development Department, L.A.-Ventura Workforce Services Division; Jerry Gaines, Chairman, County of Los Angeles Workforce Investment Board; Gloria Moore, Executive Director, Community Career Development, Inc.; Manuel Nevarez, Metro Bus Operator; Rep. Janice Hahn; Tracy-Bell Moultrie, Metro Bus Operator; Art Leahy, Metro CEO; Will Bratcher, Board Chair, Community Career Development, Inc.; Ray Tellis, Team Leader, Federal Transit Administration.